January is National Action Month for Radon Awareness. Do you know the Radon levels in your home? Do you know the effects of long term exposure to you and your children. Independent Home Inspection is offering a 20% reduction in our fee for Radon tests with or without a home inspection. This includes testing those homes that already have a Radon mitigation system. Testing homes with mitigation systems installed insures their continued effectiveness at reducing Radon to safe levels. You’re wise to check your new home for Radon before you buy. The EPA says all homes can have Radon. This includes new homes as well as older homes. No mitigation systems installed in your neighborhood may simply mean those homes haven’t been tested. So, what results do you need to make a decision about Radon levels. The answer is simply the average concentration over the testing period. This includes short term tests, as in a Real Estate transaction, or long term tests that might be done to monitor the effectiveness of an installed mitigation system. The EPA has set 4.0 piCul as the action level for a single family home. At or above that level requires a mitigation system to reduce harmful Radon levels. Independent Home Inspection uses an electret based Radon monitoring system to measure your homes Radon level. Electrets have an initial electrical charge that decays at a known rate in the presence of Radon. I use annually calibrated equipment to measure the electret charge before and after exposure and a computer generates the result on the basis of the measured differences. Electret systems advantages are many. They require no power source during testing. They continuously respond to Radon exposure rather than sampling (other methods sample hourly or ½ hourly). Results do not require a lab and accurately indicate the Radon average over the testing period. In fact this method of Radon testing has been determined to be the most accurate system available today. Exactly the opposite was true. The love he taught me was tough on him, not on me. Countless times he went to bat for me and supported me despite having to sacrifice some of his own pride, personal ambition, or leisure. In this election year we have been besieged with troubling allegations of dishonesty and corruption at the highest levels of government. We have become all too familiar and acceptant of the low standards commonly attributed to politicians. At Independent Home Inspection honesty is job number one. I report things only as they are without the exaggeration we so often encounter. Even new homes have some defects. All defects can be fixed. My pledge to you is to simply present them honestly for your evaluation. You will then be in a better position to decide how to proceed. You may not have given your garage door much thought lately. You press a button and it opens, another and it closes. Have you ever lost power to your door and had to open it by hand? Do you know how to do that? Your garage door could be quite heavy. Older overhead doors were made entirely of wood. Newer doors are usually aluminum or fiberglass. There will be a way to disconnect your overhead door from the opening apparatus so you can open it manually. This is usually a short cord and handle hanging from the track about half way to the door. pulling it disengages the door chain or cable and the door is then free to be raised. Overhead door remote operation should be checked occasionally to ensure safe operation. The ‘electric eye’ operation to prevent door closure is fairly obvious. Recommended height for this beam is 4-6 inches off the floor. Too low and it may shine under your car and allow operation when you are only partially in the garage. Less obvious is the automatic reversing feature required of overhead doors. This will reverse the door when it strikes an object while descending. This will not prevent damage or injury but will prevent entrapment of the object or person. The Garage Door Manufacturers Association recommends testing the reverse function with a 2×4 laid across the door opening. Adjustment is usually a simple operation, consult the manufacturers manual for detailed specific information. Children should be cautioned or forbidden as necessary to prevent dangerous overhead door operation. The idea behind smoke alarms is fairly simple. If you are alerted by the smoke before he flame reaches your location, you will have more time to escape. Multiple smoke alarms that can signal each other can alert you even before the smoke reaches your location. These new alarms are ‘interconnected.’ This can be done either with an actual wire or with a dedicated RF (radio frequency) signal. Many of the homes with fatal home fires were found to have smoke alarms with dead batteries. Either the batteries were simply to weak to operate the alarm or had been removed in anticipation of replacement and simply forgotten. To resolve this problem newer smoke alarms are supplied with ten year batteries and can be hardwired to the homes electrical system. Hardwiring and interconnection is a code requirement of new construction in most areas. This presents far more time to get your family safely away from the house in the event that becomes necessary. 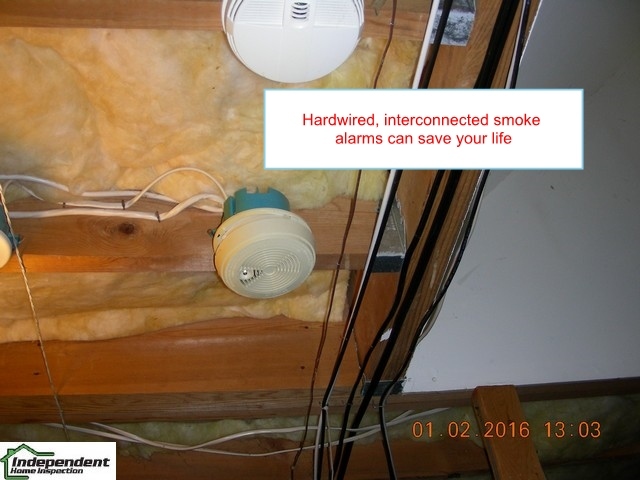 A licensing requirement for Baltimore County rental properties requires hardwired and interconnected smoke alarms regardless of the age of the property. Since many of these properties will be retrofitted for smoke alarms the wiring requirement becomes much simpler by the use of ‘radio linked’ alarms. Combination alarms that detect carbon monoxide (CO) gases as well as smoke are available to accommodate homes that require them. Interconnection provides the same advantage of time as do the smoke alarms. Don’t become a statistic. Install a smoke alarm if your home does not already have one. Become familiar with how it works and how to test and service it. As energy costs rise each of us can benefit from reduced usage. Some of the more obvious tips are the first to be forgotten. As children mom and dad always had us turn out lights when not in use. Today we can also benefit from low energy lighting such as CFL and LED bulbs. Tip No. 1 is to use low energy lighting wherever possible. A fringe benefit of LED lighting outdoors is it attracts less bugs (low heat). Clean air filters for your HVAC unit will allow it to run at peak efficiency. Tape or magic marker on your filter duct the exact filter size so you’ll know it when you need it. Tip No. 2 is to buy more than filters than you need and you’ll have spares handy to change more often. Turn the thermostat down when your not home. Programmable thermostats are inexpensive and easily installed (low voltage). Make sure you get the thermostat appropriate for your heating unit (heat pumps have special requirements). Tip No. 3 is to program your thermostat to lower heat or cooling when your not home and during the night. While you’ll only wear warmer clothes during the cold weather your house will benefit from insulation all year long. Unconditioned spaces (not heated or cooled) should be insulated from the rest of your home. Typical unconditioned spaces are attics, basements or crawl spaces, and garages. Tip No. 4 is to install or add insulation to bring you house to the recommended R value for your region. Montgomery County Bill 31-15 will take effect on October 1st of this year requiring radon testing for certain residential Real Estate transactions. In an article published last fall the ‘Bethesda Beat’ discusses some of the ramifications of this bill. The article erroneously suggests, however, that radon test kits can be had for as little as $15-25 at hardware and lumber stores. Had the authors taken the time to actually read the instructions with these kits, they would have known that an additional $50-75 fee is necessary to submit these kits to a lab by mail. For a Real Estate transaction the time required to test and mail the kits may not accommodate the settlement schedule. Radon Testing for a Real Estate transaction will require a minimum two day (48 hour) short term test. A professional Radon Testing company, like myself, can provide results the same day that testing concludes.